Comments and Suggestions are welcome. Please mail to: Tatjana Heuser. I was happy to see that my other favourite blog describing a T2000 Test ended up a keeper - Stefan Rubner is listed as the newest Sun Fire CoolThreads Performance Contest Winner on the Try and Buy Programm. I have no idea though, why they are linking to a single entry covering day 9 of his testing experience instead of the 11 Sunny Days that he’s been describing in detail up to now. So everyone who has only read that entry - don’t forget to catch up with the rest of his story. I’m glad he gets to keep his testing equipment, and am eager to read more as he hopefully continues to explore OpenSolaris and the details of zones, zfs, … with that incredible toy now his own. Now that a more reports from try and buy customers are surfacing, an incredible advantage inherent to the program is showing, that was somewhat hidden before. The program is not “just” about loaning an incredible piece of hardware that has the potential of reorganizing datacenters, with it comes a wave of support from inside and outside Sun. As people are publishing their first tentative and often untuned results, their postings get noticed by a crowd of others interested in their findings, and from inside and outside Sun, advice, help, and genuine interest streams back to them. In the end, everyone has won. The initial poster gains knowledge and advice on tuning his system, others see the testing expanded to cover their points of interest, and Sun got something from everyone - improved test results, “Niagara in the News”, and a living demonstration that their Systems are carried by a broad and supportive community. So far I had found two blosxom plugins that will generate a menu from the directory hierarchy. Both work perfectly well in dynamically generated pages, but when static pages are generated by the blosxom perl script, the same script is iterating over every single post, causing these plugins to be called again and again, raising their counters to astronomic heights. One fix would be to disable the use of these counters which is configurable with both plugins, another was to place a locking variable to avoid duplicate counting of posts. There may be a more elegant solution, such as calling this kind of plugins only once instead of once for every post, but I failed to find out if this is possible. There’s a new set of rules for the T2000 test drive “contest”. New at least that I didn’t notice them when I applied for the 60 day trial. Update: Looks like others also noted this as new. See The case of the missing servers for a breakdown. To me, the new rules don’t necessarily imply that there will be less systems given away, though, but I tend to like the previous wording better - while the updated version gives more clarity as to numbers, and might even result in more systems being awarded in total, the old version made the whole thing feel more like an award to be achieved. From first reading, it sounds to me as if under the “new rules” no two systems can be awarded in the same month, even if there are two outstanding articles. It would seem a pity to me if one month a truly excellent article finishes second just to be followed by another month seeing a less convincing piece featured just for lack (or luck) of adaequate competition. Niagara vs ftp.heanet.ie Showdown, and Niagara related posts on the same blog. excellent background article on buffer size impact Part of the value of these articles lies in the detail in which the progress is described. Later additions didn’t lead to “correction” of previous data, but were added and allow the reader to follow the progress to benefit his own learning experience. Stefan Rubner sharing his personal experience in Sunny Days @ Who Cares? I hope the team reviewing the publications likes them as much as I do. Update #2: Glad to hear that heanet got to keep the toy they’ve put to such a convincing performance. Introducing RSS, but paths to articles still inconsistent. Update: Hope this now works as intended. I’ll have to sort out how to handle the level of detail put into the feed - advocates I’ve seen range from “headlines only” to “full content”. I’ll also have to test if articles evolving from my backlog in non-chronological order will confuse aggregators. Update #2: New weirdness - duplicate entries in the feed for feed and “normal” version of individual articles. Mergel. Thanks to a pointer at Jörgs Blog c0t0d0s0, I stumbled across a very special Blog describing a T2000 test ride in detail. Special, since the author shares with us his experience from the point of view of an experienced Linux admin, describing his first steps into Solaris universe. We who are so deeply familiar with the “Solaris way” of doing things often have developed a blind spot to other ways, and things that seem natural to us (and often even escape mentioning in documentation) may be a neverending cause of confusion to others. What a chance to learn! As a side note - there’s another (not T2000 related) Blog I value for the quality of showing the “missing” links in documentation and explanation: The “unknown product manager” blogging there has made me reconsider quite a few topics. From the comments in Stefan Rubners blog, it looks like the detailled “howto” descriptions recounting his progress along the way allow others to follow his steps and advance in their own trials. This is something other blogs, as valuable as they are in their technical detail, fail to offer. Excellent! … and, a valuable marketing bonus for Sun: He’s reaching an audience Sun themselves have a hard time to reach - seasoned Linux admins and users who, if not for this detailled documentation, might not waste a thought on something as foreign as “another” OS. Both files are, just like the book, in German, but only a few German words actually made it into the index. So if there’s any entry in the index you’re missing, please drop me a mail to errata@opensolaris.in-berlin.de and I’ll be happy to include it in the next generation of the index and make an updated version available online. Auf den Webseiten des Springer-Verlages zum Buch OpenSolaris für Anwender, Administratoren und Rechenzentren stehen inzwischen das Inhaltsverzeichnis und die Einleitung zum Download bereit. An dieser Stelle entsprechend ebenfalls, gegen Abend des 4.4. kommt noch der Index hinzu. The default configuration of the Markdown plugin interprets semicapitalized spelling as “WikiWords”, and tries to link to Wiki pages that didn’t exist. This broke Links to OpenSolaris.org and others. Struggling to disable. The first “fix” was to “cheat” and redirect those Wikilinks to Wikipedia. The article on OpenSolaris there is well worth reading, and certainly a better user experience than a “page not found” error. This did work for some articles, but not for others. - may be yet another problem with static page generation? Setting this to 1 stopped those WikiLinks from popping up, but that really didn’t look like what the programmer intended. Digging a bit deeper, I found out that the variable “Use WikiLinks: true” in the header of one article activated the whole thing for all subsequent articles, even if they explicitely disabled that setting in their own header. Tomorrow it will be two weeks since I’ve applied for the trial, but so far there has been no reply or contact related to that application at all. Most of the text on the temporary page has been converted to blosxom, which makes writing content a fast and easy process to the user (me). As with most systems, it took me a while and a handful of examples to understand how to configure it. There’s a backlog of notes from CeBIT and Events held by Sun in Berlin which I’ll be adding during the next days, and also, the long awaited Contents pages of the book (in German, I’m afraid) should be downloadable soon. Oops. I just noticed that statically generated pages have a few counters running weird, as can be observed in the menu to the left where accumulation leads to an unpredicted boost in article statistics. Not surprising, a good number of the words on these pages are catalogued in the list of Trademarks registered by Sun Microsystems. Nevertheless, the pages at opensolaris.in-berlin.de are not maintained by, or affiliated with Sun. We’re as independant as a group of users and admins with a deep rooting history of SunOS and Solaris use can be. Thus: we’re biased, we’re prejudiced, we’re partial, but the opinions we’re expressing are our own alone. Centered around the Operating System Sun has licensed into the Community, OpenSolaris, this site is supposed to be a place to share ideas, personal experience, updates and additional material for the book and as a virtual home for a local OpenSolaris user group in Berlin. Occasionally the odd computer component, program, OS, … may be mentioned which has not been made by Sun (what a strange and foreign world…). Names for these may well be in the property of another company, but they’ll be somewhat of a minority since the focus of these pages lies at OpenSolaris. For an exhaustive list of Sun Trademarks, please see the corresponding List of Sun Trademarks at Sun.com. Among many that are well known and obvious, quite a few terms that have sunk into collective common use may be found there, bearing witness of some of the chapters of the history in network computing that have been written at Sun. I used to write my html with vi. Without doubt, this has been very preferable to using visual editors, but given the repetitive characteristic of structuring elements, this also meant that I spent a lot of time on code rather than content, with the additional option of introducing inconsistencies across multiple pages. To sum up in brief: I’m still writing my html with vi. But I’m spending a lot less time on the code, since that is taken care of by blosxom, written by Rael Dornfast, with extensions written by the community. I’ll describe more on that later, when the main structure of these pages is settled. Leider wird in der Mail nicht weiter darauf eingegangen, worin nach Auffassung des Verfassers der Mail das eigentliche Problem besteht, was eine Lösung des Problemes erschwert. Der betreffende “company name” setzt sich aus Vor,- und Nachnamen des betreffenden Autors zusammen - die zu ändern ist schwierig, ein Zusammenhang mit Sun Trademarks ist auch nur schwer herstellbar, keine der Komponenten des Namens ist in der unter dem angegebenen Link verlinkten Liste geschützter Begriffe aufgeführt. Der betreffende “product name” schon eher - das Buch führt schließlich den Begriff “OpenSolaris” im Titel. Diese Verwendung war mit dem Verlag abgesprochen, und von diesem auch im Vorfeld geklärt worden. Darf ein Buch über OpenSolaris dieses Wort nicht im Titel tragen? Möchte Sun, daß das Buch (mit einer Frist von 90 Tagen) zurückgezogen wird? Muß es einen anderen Titel erhalten? Soll der Untertitel in einen Copyright/TM Hinweis geändert werden? Vorschläge, Gedanken, Ideen sind per Mail an theuser “at” opensolaris.in-berlin.de willkommen. Betont werden muß an dieser Stelle, daß diese Reaktion bisher ein Einzelfall ist. Die Reaktion der Sun Mitarbeiter, denen wir das Buch vorgestellt haben, war ausnahmslos sehr positiv und in jeder Hinsicht unterstützend, bis hin zur Vorstellung des Werkes auf Präsentationen von Sun in Deutschland. Ich würde eigentlich lieber das Buch nehmen, meinte der Gewinner der U20. Aber etwas Hardware zum Testen konnte er auch gebrauchen, und so wurde das Buch wie vorgesehen separat verlost. Mich freut sehr, dass es seinen neuen Standort an einer Universität findet. Die Autorenexemplare des Buches sind eingetroffen! Wenn alles geklappt hat, wird auf den Sun System Manager Tagungen 2006 jeweils ein Exemplar des Buches unter den angemeldeten und anwesenden Teilnehmern verlost. Right after CeBit I stormed the T2000 “Try IT Free for 60 Days” offer. It looked like a simple click-through-and-be-happy, but reading the License agreement I found that I couldn’t sign it in good conscience, which probably wipes me from the list of eligible recipients. 4.3.Company agrees not to incorporate any Sun Trademarks into Company’s trademarks, service marks, company names, Internet addresses, domain names, or any other similar designations. Apart from me not being a company, both the title of the book and this webpage use the name OpenSolaris, which is a Trademark owned by Sun. Especially the limitation “Internet addresses” most likely would apply to many others as well, who might be using Terms like Sun, Solaris, OpenSolaris etc as part of an URL. All hope isn’t lost yet, the acknowledging page read “your responses to our qualification questions require us to review it further”, promising that “A Sun sales representative will contact you further”. So far, this hasn’t happened though, and I keep fearing that it won’t. At the From chaos comes order blog I found a number of extremely useful tools when it comes to data center planning described, among them Power Calculators that are supposed to show a realistic figure for power consumption by the new systems. I’m including direct links to these Power calculators here, but don’t miss the entry at that blog itself. They’re configurable into nit-picking detail, did anyone compare the calculated values with measured ones to get a sizable error dimension? While the around 70 Watts per CPU is something to get excited about, there’s no reason to hide the values for a fully stuffed system. I’m afraid these systems won’t perform well as auxiliary heating. At CeBIT 2006, a small number of Schillix-CDs are being handed out as a promotional item for both Schillix and our book. Schillix is based on OpenSolaris, and since it’s a Live-CD, it’s offering the possibility for an instantaneous test-drive. Featured on the label side of the CD is the cover of the book, together with a snippet of the Schillix boot-screen, and the logo of Joergs employer hosting his opensource activities. At the Sun booth, these CDs can be complemented with the OpenSolaris DVD which, based on my observation, is in high demand. Both CD Cover and Schillix image can be downloaded from their respective sources. Schillix ist die erste außerhalb von Sun entstandene Binärdistribution, die auf den von Sun herausgegebenen OpenSolaris Sourcen basiert und zudem als Live-CD, d.h. ohne vorherige Installation auf der Festplatte, lauffähig ist. Zur CeBIT 2006 ist Version 0.5.1, basierend auf build 35, in einer kleinen Auflage auf CD erschienen und auf der Messe erhältlich. Das Image der CD und die dazugehörigen Sourcen sind per ftp vom BerliOS Server herunterladbar. Für alle, die leer ausgehen, oder ihrer “Selbstgebrannten” ein Label geben wollen verlinkt das oben abgebildete CD-Label auf die Druckvorlage, die auch zur Beschriftung der auf der CeBIT verteilten CDs verwendet wurde. Eric Boutilier hat auf der opensolaris-discuss Mailingliste und in seinem Blog in einen Kurztest seine ersten Erfahrungen mit dieser Release beschrieben. Just in time to reach the exhibition at CeBIT, the first few copies of the book were hand-made and shipped to Hannover. Two of them were circulating across the fair: One was carried (lugged, rather, for its hefty 5 pounds) around by Joerg, one of the authors, and another one had been on exhibition at the eMedia booth displaying books and it-related magazines. Pünktlich zur CeBIT wurde das Buch in enger Zusammenarbeit aller Beteiligter fertiggestellt und in einigen wenigen vorab gelieferten handgebundenen Exemplaren gezeigt. Leider sind diese so rar, daß bis Montag kein Buch dauerhaft bei Sun am Stand war, und auch keines bei Springer-online in Halle 3. Ein Exemplar liegt bei eMedia in Halle 5, am Stand E38 aus, das andere reist in der Tasche von Jörg Schilling über die Messe und ist daher des öfteren am Sun Stand in Halle 1 anzutreffen. Am Dienstag den 14.03. und Mittwoch den 15.03. wird Jörgs Exemplar voraussichtlich den ganzen Tag über bei Sun am Stand A90 in Halle 1 ausliegen. This is a temporary item, the linking section should appear in one of the sidebars for better visibility, but I’m still struggling with the template to get this to work the way I want it to. Diese Links werden noch einen festen Platz im Seitenlayout finden. Vorerst als separater Artikel. Community Webpage mit Diskussionsforen, Informationen und Links zum Download der Sourcen und Binaries. Offizielle Seite bei Sun.com, Informationen zu Solaris 10 und Download der aktuellen Release Solaris 10 1/06. Informationen und Ankündigungen zu allen OpenSource Projekten von Sun. 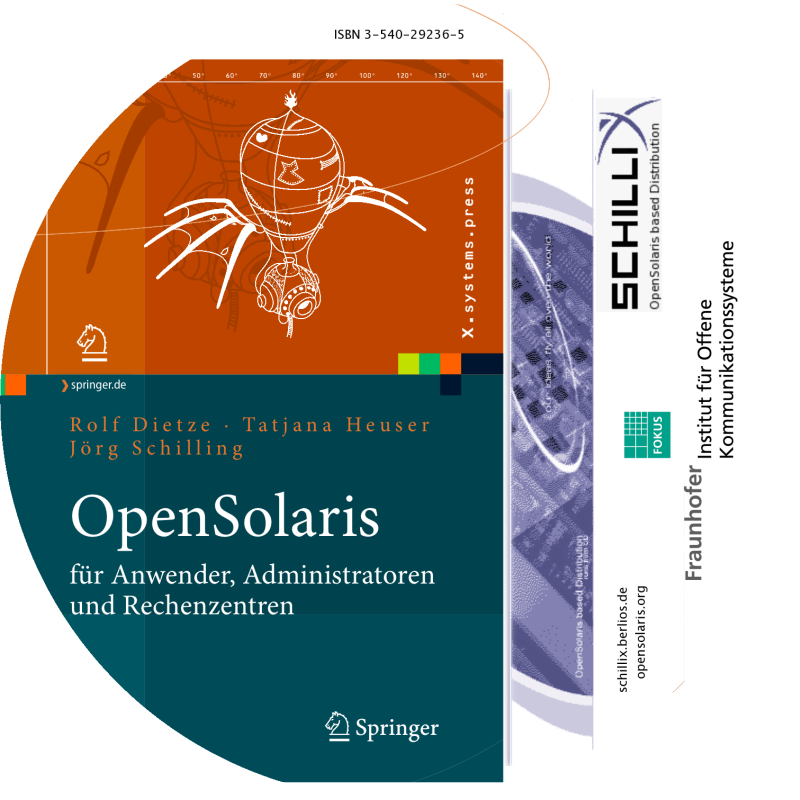 Seitens des Verlages gibt es selbstverständlich eine Informationsseite zum OpenSolaris Buch .